How do you pet a porcupine? With that hair a fright? How do you pet those needles? Without your hand going through it. Get your sister to do it. In a large mixing bowl, combine milk, water, yeast and 1 tablespoon of sugar. Let sit for about 5 - 10 minutes, or until foamy. Add salt, olive oil, the remaining of sugar, and 3 cups of flour; knead until smooth. Stir in just enough remaining flour to form a soft dough. Continue kneading for about 6-8 minutes (dough will be sticky). Place in a greased bowl, turning once to grease top. Cover with kitchen towel and let rise in a warm place until doubled, about 1 hour. Punch down dough, then turn onto a floured surface; divide the dough into 24 pieces. Place a tablespoon of chocolate morsels in a center of each bun, seal the edges together by pressing. Shape the chocolate filled buns into oval shapes, and snip the quills using the tips of a scissor, leaving just enough space on one end for the face. Place pieces of dried currant for eyes and transfer the buns onto greased baking sheets, about 2-inches apart. Let sit to rise for about 30 minutes. Bake at 375 degrees F for about 20-25 minutes or until golden brown. Remove from the oven and immediately brush the tops with melted butter. Well this is an excellent way to put a creative twist on bread buns! They really are cute and I love the lead in to this recipe. Well done! This is sooo cute! Love the recipe and photo is adorable! Awwww these are SO cute! :) Adorable. And mmm, chocolate buns! These are adorable! My kids would love these. Hi Janet. It's just something I found online. I thought it was cute. So brilliant and too adorable, and I bet tasty. Those are freaking adorable, particularly with the little currant eyes! This is downright adorable! And, I think even I could make them! What a fun post, thank you! This made me smile today. Sure you can, it's actually not that difficult to make. Might be a fun project to do with the kids, too. Well thank goodness I don't have a sister! 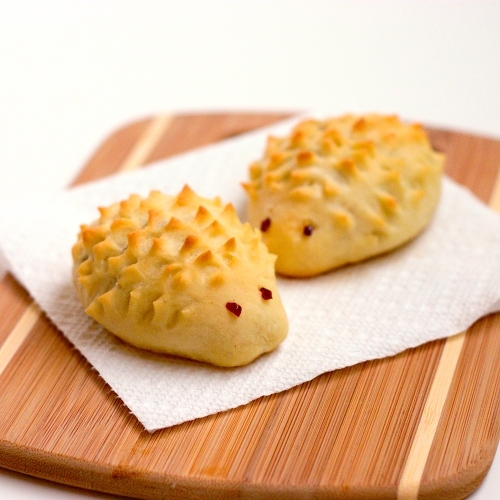 On the other hand my girls would LOVE to make these and be sisters together coated in flour. Great idea, Sandra! I don't have a sister either, and I only have two sons. Regardless, they loved it. These are adorable! Thanks for sharing how to make the spikes...fun idea! At long last, I can put my animal cracker recipe to rest when we visit the zoo. That is the only animal-themed recipe I know. This looks really unique and fun to make. Thanks! How cute! I am planning a play school lesson about animals, and this would be a perfect snack. I'm pinning this to make sure I don't forget. Thanks for sharing! Soo cute! I feel like my quills would turn out ugly though. These are too cute!!! I love the little morsels of chocolate hiding in each porcupine. Unbelievably adorable! These would be so fun for brunch! I think these are the cutest things I've ever seen! I think they are almost too cute to eat - good thing they're filled with chocolate! Cute! Cute! Cute! I love them! I bet they taste amazing too! Wow! I love these little guys! Oh my goodness - those are ridiculously cute! I'll have to remember the trick of snipping with scissors to get the quills on top! Any idea how long these will keep,, Making on Friday for Easter Saturday ( or freeze ), Really cute ! !